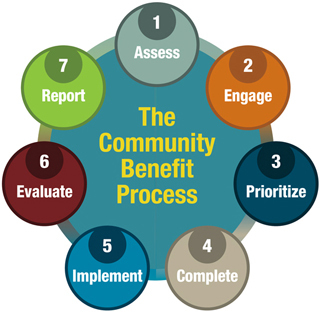 Community engagement is focused on creating increased participation in decision making. It provides an effective process for working on community health needs/problems by engaging people, organizations and community resources. Community benefit initiatives can focus on unmet health needs, increase knowledge and practices to reduce health disparities and build healthier communities. To do so, community benefit work must involve partners from many other sectors, such as banks and community investment organizations, affordable housing groups, resident groups and public education. Why work across sectors? Such multi-sector partnerships can work to effect changes in public policy, fund priorities and resolve problems that may seem intractable. The community health needs assessment process required of nonprofit hospitals, as well as public health departments, provides the basis for creating implementation plans to address unmet and priority population health needs. Methods for conducting needs assessments include a determination of resources, assets and needs. A focus on including community resources and assets in community needs assessment processes helps to move the vision and emphasis of the hospital’s work from a sick care approach to a healthy communities approach. One community engagement resource merits particular attention. It can be described as a different way of knowing. Generally, scientific, academic and professional knowledge is based on evidence that can be empirically confirmed and used to replicate an event or process based on the evidence. There are many reasons to use this kind of knowledge in community problem solving. However, if it is the only method for discovering and creating knowledge, a community engagement process can miss important insights that also are very valuable in problem solving. The following example illustrates the different way of knowing. A tribal nation was among the partners in a community health improvement collaboration that focused on increasing healthy behaviors among various adolescent groups. Other partners included professionals from public health departments and educational institutions, most of whom were highly skilled in evidence-based best practices. The native partners suggested that, to address the health issues of their adolescent group, they would use the strategy of canoe pulling. Several of the professional partners said there was no indication in any evidence-based literature that such a strategy was ever used, let alone proven effective. The tribal partners explained, however, that canoe pulling (paddling) was a very strenuous physical activity and an important tradition throughout their tribe’s history. Values were taught to the young people who were encouraged to participate in this ritual. The young people who became canoe pullers realized that they needed to be in very good physical condition. Their alcohol and tobacco use declined, and their healthy eating choices improved. The tribal partners documented improvements in adolescent health based on these indicators of a better lifestyle. They demonstrated a different way of knowing. A different way of knowing in community engagement neither invalidates nor replaces traditional methods for identifying problems and developing solutions. Rather, it demonstrates that it is possible to find the best solutions to problems when there are many ways to determine the nature of the problems and how to address them.